Looking for Jumeirah jobs and careers opportunities in Dubai, UAE? You are landed on the right place and at the right time. We listed all latest job vacancies directly from Jumeirah careers page. No need to get upset from fake job posting and fake recruitment. Because you are going to submit your details with Jumeirah website. Jumeirah hotel and resorts is one of the leading luxury hotel network in UAE and 7 other countries. Currently they have 25+ properties and 13,500 staffs from 140+ countries. So now is your chance. Jumeirah invites fresher and experienced professionals to apply for new career opportunity. We assure that Jumeirah hotel and resorts is the best place to work in United Arab Emirates because of competitive salary, medical insurance, education allowances, accommodation allowances and annual leave with salary. Jumeirah group accepts job application via career website. Because they receiving thousands of job applications everyday and they bring this policy to make recruitment process simple. 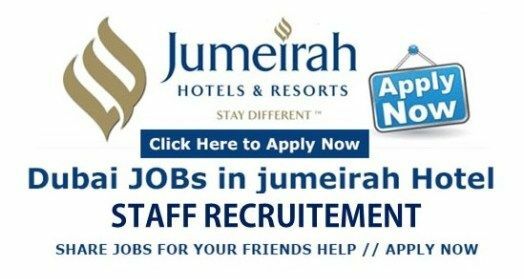 How to apply for Jumeirah jobs? On next page we listed all latest job vacancies from hotels and resorts. This link is given below of this article. Once you found suitable jobs, then click on job title and it will redirect you to Jumeirah hotel website. You can upload and register your resume and portfolios on profile management system. Once you submit the job application, immediately you will receive a conformation e-mail and after 48 hours you will get another response if you pass first round. Because of huge job applications you have to wait 30 days to complete the recruitment process. Please note that for certain job roles you have to submit your attested original education and experience certificates. The HR department will let you know about these things. Note: We are not a recruitment agency or not a Jumeirah recruitment partner. Wedado.com is just publishing jobs and guide you to get jobs.